I have re-subscribed! I really did miss this box out of everything I have tried in the past. I realize I got this a little late compared to others but none the less lets get on with the review. This is for the original box (there is a vegan option and one day I will review that one too). 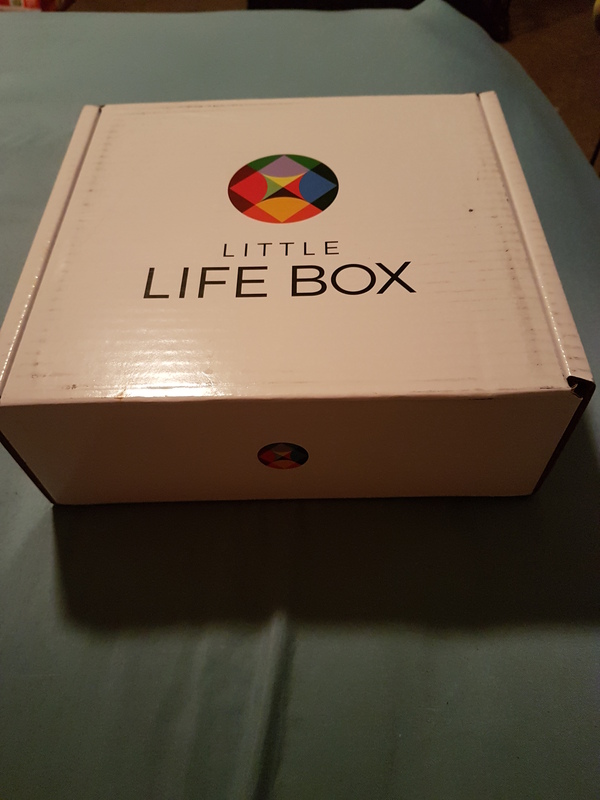 The box cost $23 + $5 shipping (CAD) on a monthly subscription. I also just learned that they are now shipping to the USA. 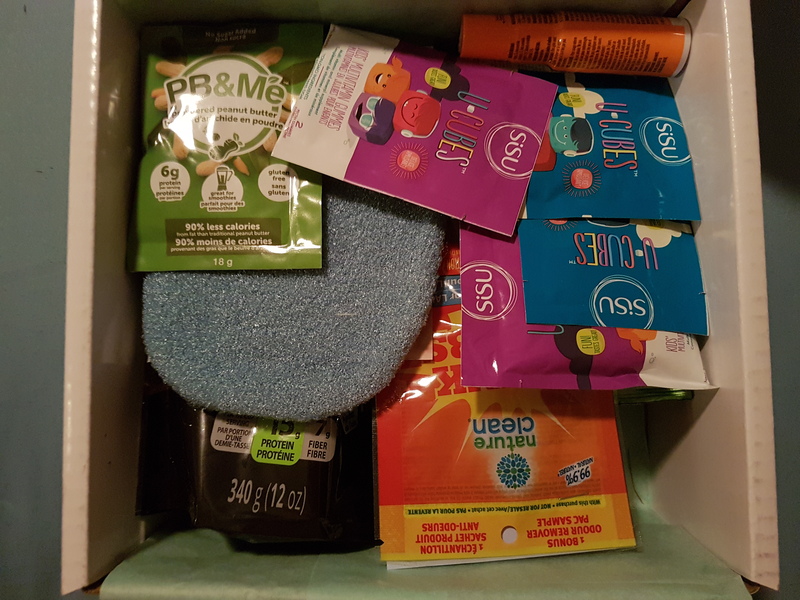 It is a healthy lifestyle subscription box that features a lot of Canadian companies. This is a big deal for myself as I try to be aware when shopping where my item(s) are being made or where the company is located. This allows me to discover and try new things before purchasing the full product or the full line of flavours and such. I seen this beauty as soon as I opened the box up. 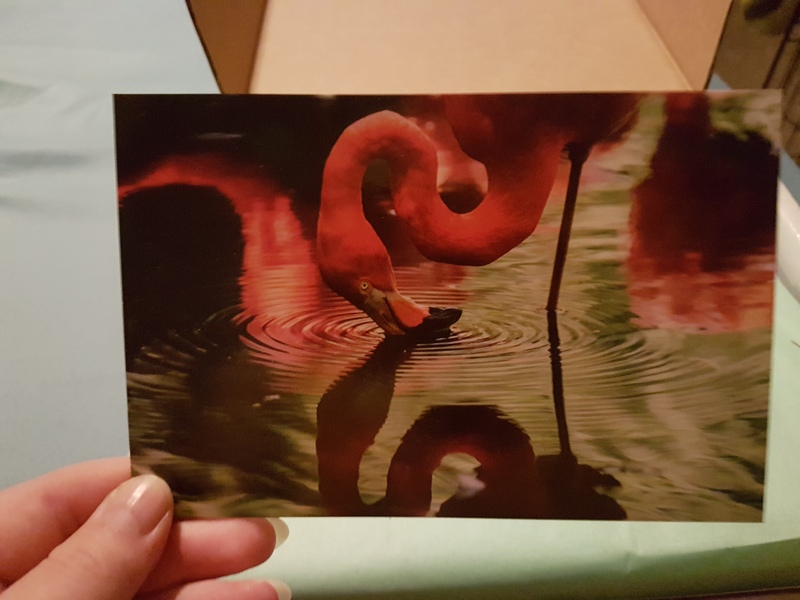 I do love flamingos and I think the postcard is gorgeous. It will be finding a place in our home. Right off the bat there is a variety of items. They have really covered their bases with this box. 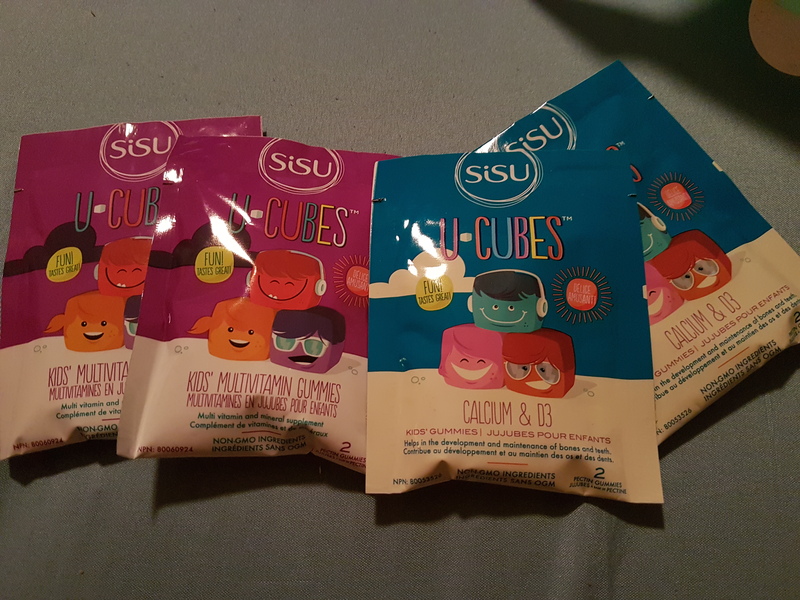 Here we have SISU U-Cubes, two samples of each. Calcium and D3 children’s chews and Multivitamin Gummies. *Update: These are being disposed of by the pharmacy as we do not have much use for them. 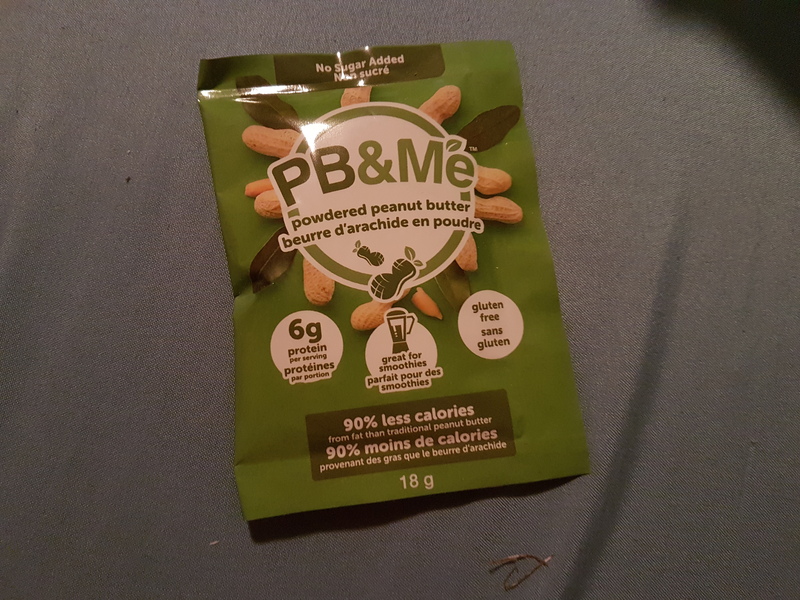 Powdered Peanut butter *no sugar added by PB&Me. I am a huge fan of this idea and to top it off this sample is no sugar added. For me I do not see a need to sweeten peanut butter. So excited and can see this being a future purchase. 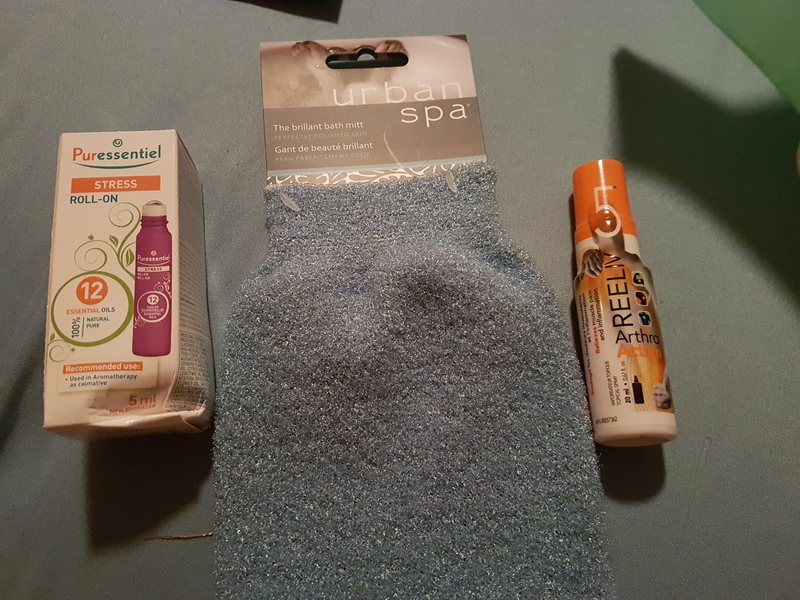 We have an Urban Spa bath mitt in the middle. Honestly my skin is to sensitive for most of their products. However I am making a very nice self pampering gift basket. On the left is a stress roll-on by Puressentiel. It does seem to have quite a strong lavender sent to it. Despite that I am going to give it a fair shot (lord knows I could use help de-stressing). On the right we have Arthro Action by Reeliv5. It is a topical spray that relieves muscle pain and inflammation. This item in particular I am not able to use right now and won’t be able to for a while. However I have lucked out and it does not expire till December 2019. 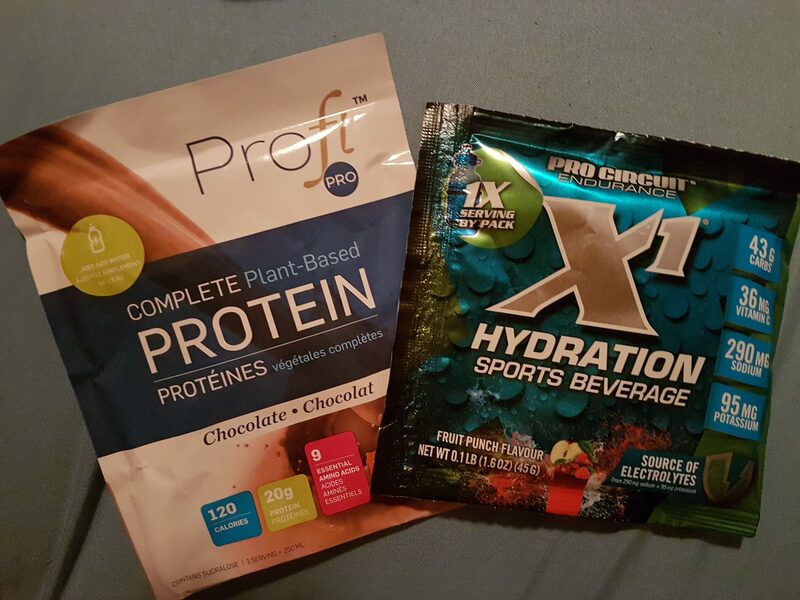 Chocolate flavoured plant based protein powder by Profit Pro. Now protein powder is not really my thing but I will add it into a smoothie. We also have fruit punch flavoured powdered sports beverage by Pro Circuit Endurance. It will be interesting to try. On the left is a raspberry flavoured fig bar by Natures Bakery. I have seen these at the store and have never picked one up for some reason. I enjoy fig bars and need to be adding things like this to my day anyways. Great reminder! 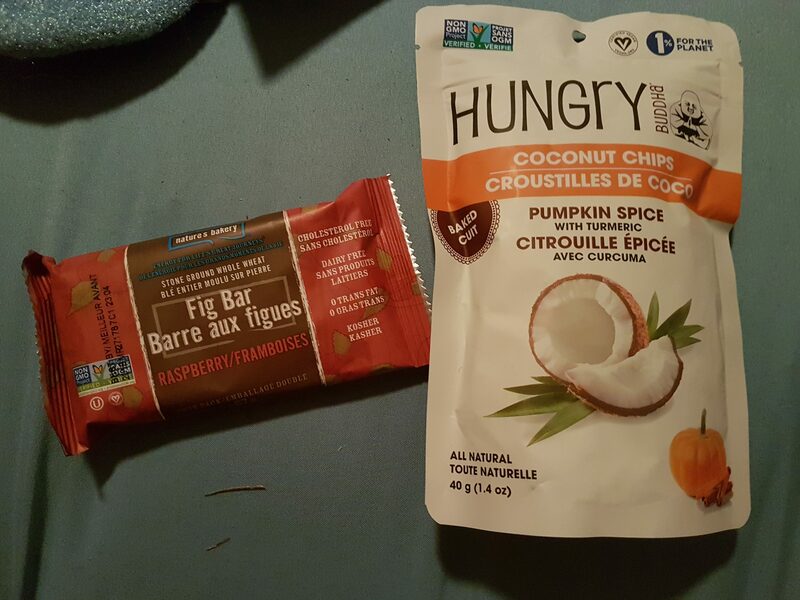 On the right, pumpkin spice flavoured coconut chips by Hungry Buddha. Not a pumpkin fan so hopefully this does not ruin the first experience of coconut chips. *Update: Fig bar was fantastic and I will be buying some to have in the pantry to snack on when running out the door. *Update: I have not tried the coconut chips yet but Mr. did and he is not a fan. 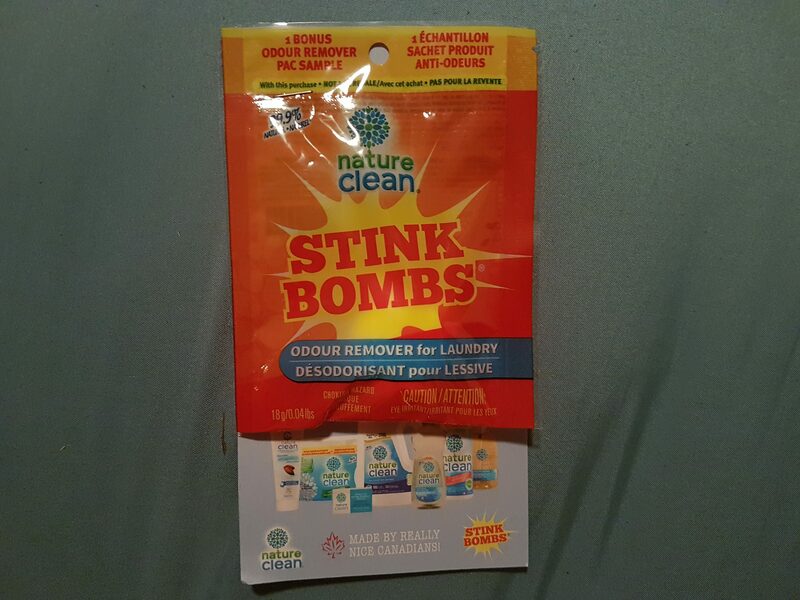 A sample pack of stink bombs by Nature Clean. It is suppose to be an odour remover for laundry. This is not something that is really needed but I will do some research and maybe use it on the dog blankets. I think that will be the only way of finding out if it actually works. I have never tried this cleaning brand I might give them a shot. I do love how the small info paper at the bottom says ‘Made by really nice Canadians!’. *Update: Gave this a shot with the dog towels and blankets. It worked and they seem clean but I regularly clean the dog item so not sure how well it de-stinks items. Last item and I am psyched for it. 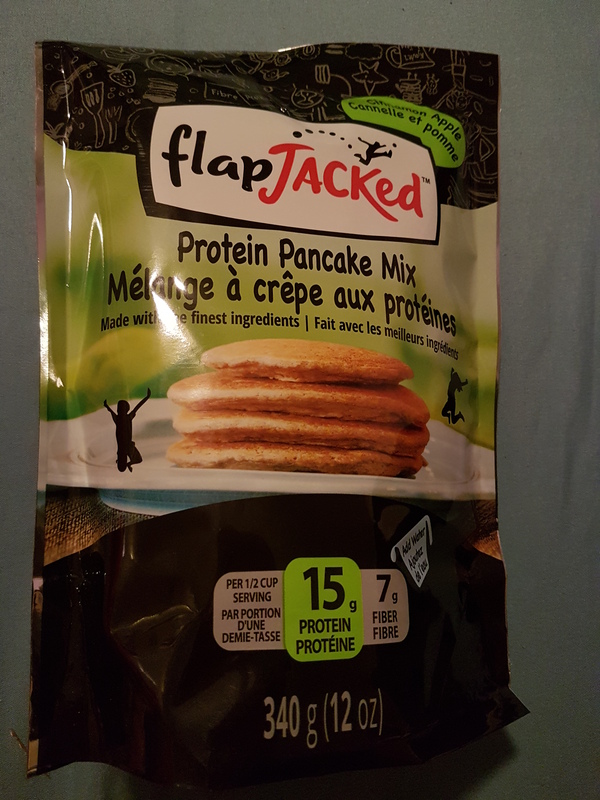 Protein Pancake Mix by flapJacked in the cinnamon apple flavour. I do want to add a little more protein into my diet and this would be perfect. As long as we like it that is. I really do have my fingers crossed for this product. There were a few information cards. Unfortunately Puressentiel’s brochure is in French and I can only understand a few words. Not a big deal to check out their information online but the brochure is a waste of paper in this case. Other than that I am quite happy with this months box and while not everything will create future purchases from these companies. I have a chance to try them and I would not have otherwise. As I go through the products I do plan on updating the post.